Revista de Sciencia Rosa Cruz e Occultismo / Revista Mensal Illustrada. Rio de Janeiro, Brazil. Language: Portuguese. 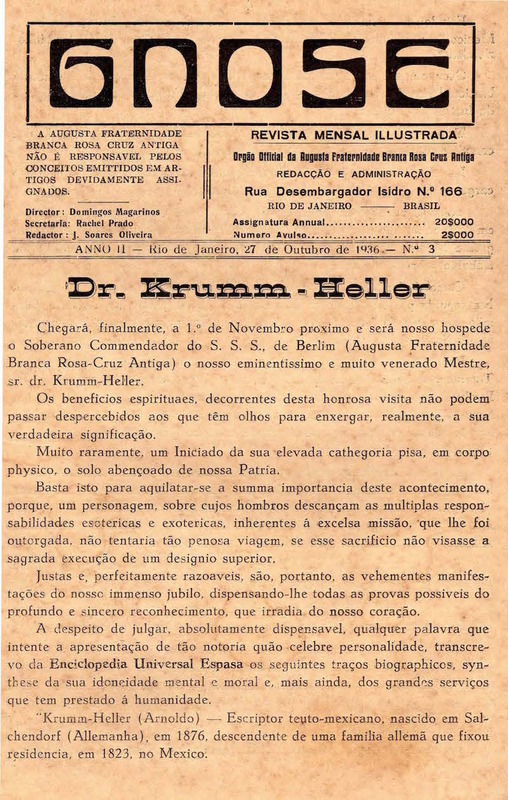 Editor: Arnoldo Krumm-Heller; Domingos Margarinos, J. Soares Oliveira. 1/1, August 1935-1989(?) 32 pp. This was the organ in Brazil of Krumm-Heller's Fraternitas Rosicruciana Antiqua. Several issues reproduced in Peter-R. Konig, ed., Ecclesia Gnostica Catholica: Die Gnostischen Neo-Christen (Munich: ARW, 1998), and the issue for October 1936 in PDF format in http://www.upasika.com.